With the demise of Passport to Worldband Radio a couple of years ago, There are two definitive books for the shortwave hobby remaining. 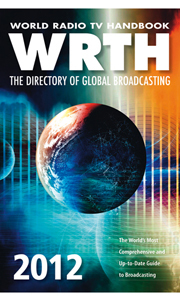 The one most recognized is the World Radio TV Handbook (WRTH). The 2012 edition is available over at Amazon.com for $22.63. Also, although I've never owned one, many people also swear by the Klingenfuss guides. The 2012 edition of the Shortwave Guide is also available now over at Universal Radio. If anyone is familiar with the Klingenfuss guides, please leave me a comment. Thanks!